It doesn't get much better than world-class music under the towering San Juan Mountains in beautiful Telluride, Colorado! Showcasing a mix of jazz, soul, funk with interactive artist performances, intimate late night shows, luxurious VIP and patron experiences, children's activities and much more, the Telluride Jazz Festival is one of America's most dynamic destination festivals. This August 3 - 5, enjoy live three days of live performances from Bruce Hornsby & The Noisemakers, Irma Thomas, Soul Queen of New Orleans, Karl Denson's Tiny Universe, Jaimoe's Jasssz Band, BADBADNOTGOOD, Turkuaz and many more. Enter to win a trip of a lifetime! 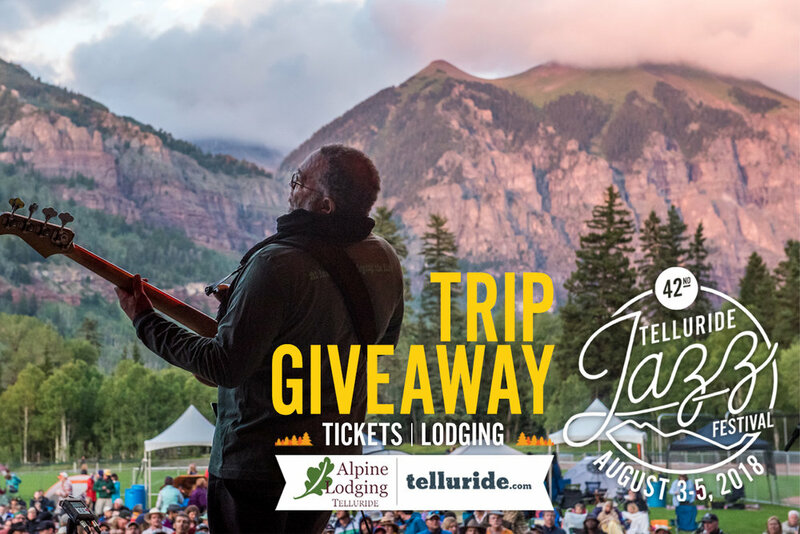 The Telluride Jazz Festival has teamed up with Telluride Alpine Lodging and Telluride.com to give away a pair of tickets and lodging for two for the 42nd annual Telluride Jazz Festival, August 3 - 5. All you have to do is get to Telluride! This contest closes Wednesday, July 11, at 12 pm. Enter now! Located in the legendary outdoor venue in the breathtaking mountain town of Telluride, Colorado, the 42nd Telluride Jazz Festival, August 3-5, 2018, celebrates the rich tradition, modern styles and cutting edge progression of the American Jazz art form delivering an unmatched aesthetic experience. SBG Productions brings a new era to the Telluride Jazz Festival, showcasing three days and nights of world class jazz, funk, soul, folk and gospel, with a goal of community engagement and student education. A musically-charged local culture accompanied by a wide variety of special events including interactive artist performances, children's activities, cozy late night club shows, on-site camping, outdoor recreation, jazz art walk, historical walking tours, and much more will round out the weekend celebration. The historical mining town of Telluride sits nestled in a scenic box canyon at 8,750 feet, surrounded by 13,000 foot peaks, and is a prized gem of the Rocky Mountains. By entering you agree to receive email marketing communications from the Telluride Jazz Festival, Telluride Alpine Lodging and Telluride.com. You may unsubscribe from these emails at any time. You must be 18 or older and a resident of the US to enter. Entries close Wednesday, July 11, 2018 at 12:00 pm (MT). A winner will be contacted on July 11, 2018 at 2pm (MT) via email and will have 24 hours to confirm redemption of prize before a new winner is selected at random. Festival Passes and lodging conformation will be sent via email. Sunglasses and swag bag can be redeemed at the Telluride Jazz Festival. Prize package is not for resale.